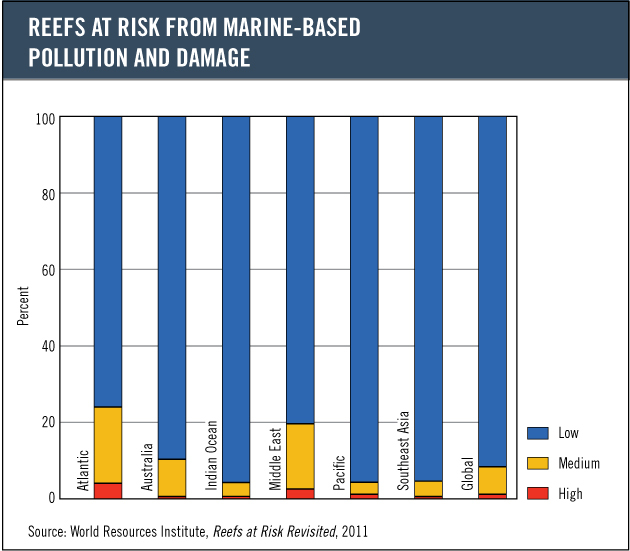 Marine-based sources of pollution and damage threaten approximately 10 percent of reefs globally, with only about 1 percent at high threat. This pressure is widely dispersed around the globe, emanating from ports and widely distributed shipping lanes. The Atlantic, Middle East, and Australia are the regions most affected. Despite advances in monitoring shipping traffic, these data are incomplete in that they exclude all fishing and smaller recreational vessels, so this estimate should be considered conservative.